Pain Physicians NY (Brooklyn, Queens, Manhattan, Bronx NYC) is one of the first practices in New York to offer an alternative treatment for pain in the neck. Depending on severity of the pain we might offer Platelet Rich Plasma (PRP) injections, Interstitial Laser Therapy, Pulse Stimulation Treatment (P-STIM), Electrical Nerve Stimulation therapy. We are Approved New York State Department of Health Medical Marijuana Facility. Our facility equipped with the most advanced, cutting edge equipment to treat Cervical radiculopathy. Any condition that affects the nerves of the neck are described as cervical radiculopathy. The neck, medically referred to as the cervical spine, is formed by 8 vertebrae that start from the base of the skull to the shoulders. Cervical nerves radiate out of 7 of these vertebrae and branch out to supply sensation to the shoulders, arms, hands and fingers. Cervical radiculopathy, therefore, causes symptoms across the entire upper body and the extremities. Often, damage to the cervical nerves causes damage to the entire region served by the specific nerve. For example, there may be pain in the shoulder if the affected nerve was responsible for supplying sensation to the shoulder. Most of the time, though cervical radiculopathy affects the entire arm, from the shoulder to the fingers. The pain varies from one person to the other, sometimes presenting as a sharp and severe pain, while others experience a dull pain all over the arm. Besides pain, cervical radiculopathy may cause weakness in the arm and numbness in the affected areas. It can also cause a tingling sensation usually described as ‘pins and needles’ kind of pain. Muscle weakness is often common of the affected arm. Because any condition affecting the cervical nerve can lead to cervical radiculopathy, there are several causes that lead to it. 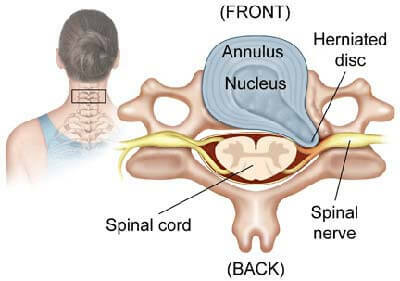 There are many other causes to cervical radiculopathy including sarcoidosis and tumors that all affect the normal functioning of cervical nerves. The diagnosis of this problem is initially done through an analysis of the symptoms experienced by the patient. However, these may not be enough and further tests need to be done to eliminate other causes of the pain felt. Most of these tests involve scans that provide images of the spinal vertebrae in the neck such as X-rays, CT, MRI scans and electromyography. In the worst cases, surgery may be performed on the cervical spine to solve the problem. Surgical therapy is the last treatment option when other methods have failed to relieve and control the signs and symptoms of Cervical radiculopathy.